Can’t see the Trees for the Woods? There has been a debate going on for a wee while. It gets some publicity from time to time. At the moment it is out for consultation, and survey. All thoughts welcome. And it’s easy to add your own tuppenceworth, should you wish. Should Scotland have a national tree? And if so, which one? I read a fine essay on the subject over the weekend. It came from Dr James H C Fenton, who is a bit of an expert on matters arboreal. Most recently head of conservation in the Falklands, he’s been landscape policy adviser to Scottish Natural Heritage in a career that began studying Antarctic peat. So, words from the wise methinks. Dr Fenton explores the tales of the fabled Great Wood of Caledon, the possible reinstatement of which is part of the move behind nominating the Scots Pine; replacing all those plantations of spruce and larch and conifer covered hillsides, with something a bit more natural. Ultimately though he favours either the rowan or the silver birch; or even the heather if we lower our sights nearer to ground level, and have a shrub as part of our identity. In his view we need to set aside the sentimentality of Pinus Scotus, which may be largely down it having Scots in the name. Identity is important. We are about to be our own nation. And a peer of the realm, a former socialist and man of the people who became head of Nato and then took the ermine for his unelected place and tax-free largesse, has told us that we have no culture, no identity. So a symbolic tree is important at the moment. A tree is just one of the many marks of our cultural identity. I’ve spoken before of those mighty Cadzow Oaks not far from here, relics from the days of ancient Kings of Scotland. A tree is a serious symbol; it is not a c-u-jimmy-hat, or a piece of tat for the tourist hordes on the Royal Mile. It can be a source of pride, an identity. So assuming we agree that a tree should be part of it all; which one should it be? Dr Fenton argues against the mighty pine. He reminds me of the humbler trees around the policies here, the ones that stand up to the harsher weather, and survive, and thrive. I like the silver birch; the one that we grew from a broken branch on a woodland walk somewhere long forgotten. And I like the rowan. We planted that at the millennium. It fills a gap where some non-native eucalypts stood, until it got too cold. Or there’s the horse chestnut, coaxed from a conker by FirstBorn when he was but an Urchin himself, growing and spreading with him, strengthening and putting down roots as the years pass. And the rowan grows, and it feeds the birds. It adds the colour of the rainbow trout to the mackerel-shoaled background of the average West of Scotland sky. And it has lots more fishy business to it. For the rowan is steeped in myths. It keeps the witches at bay. From the fruit we might make jelly, wine even. Fine accompaniments to the meats of the woodland and the hillside. And Rabbie wrote a song about it. So after a bit of thought, I’ve plumped for the humble rowan. Go on, have your say. Fill in the survey. For we do have a culture, and an identity. And a tree would be a fine symbol of that, wouldn’t it? Yes that’s right, the Monday night edition. The one where the main topic for discussion was the crowd-funded poll carried out by PanelBase, and commissioned by our old friends at Wings Over Scotland. Paid for by us all. So I make no apologies for turning again to matters Referendum. Events have taken a turn, and I need to prioritise these comments ahead of other planned articles. The first of Rev Stu’s polls was largely ignored by the media, but it gave good pointers for the next one; made sure there were no reasons it could be ignored. And it spurred supporters into striving for more. The input of a psephologist was obtained in setting the questions. And some masterly analysis – nothing less was expected – carried out by Stu himself, to which we’ve referred earlier. Scotland Tonight grew a pair, and gave full billing to the poll, screen shots of web pages familiar to many, new to more, focussing on the positioning of the current Don’t Knows, left of centre, as Scotland is. And that really means there is only one place for them to go. But first they need to sit down and think about it. They need to find the information. It is out there, but won’t be spoon-fed to them by the media. The Westminster Party doesn’t like it. Collectively they’ve probably known it for some time, but to see it on the nation’s screens, talked about, is just a bit too scary for them. Game On. Leading psephologist and media go-to man, Professor John Curtice, has hailed the poll as one of the most significant reviews undertaken, ever. And here’s another take on the findings, from Newsnet – and while you’re there, order one of their car stickers, spread the word. In the aftermath of the programme Stu, as he does, has taken a little umbrage, at one of his pet themes. The graphs were out of kilter. He has a point. The programme then went on to discuss the findings, the socialist leanings of the people who matter. And they had one from each side of the divide to give it balance. Dennis Canavan, lifetime socialist and long-time Labour Party parliamentarian, spoke good common sense. He chairs the Yes campaign, having seen some time ago, the lie of the land, so far as his former party is concerned. But his opponent was none other than Westminster Bully-Boy Ian Davidson MP, he of the ‘doing’ threats for women who stand up to him. Davidson’s remit seemed to be solely to see how many times he could mention that word, the one banned in Westminster, usually for no reason whatsoever. And so his diatribe, amusing for hearing the Labour Party again deny socialism, was peppered with rants about separation/separatists/separatism and so on. He is a turgid bore; and an ineloquent one at that. I’ll give you socialism, sir, it’s where the Don’t Knows are. I wonder how many of them you persuaded to make a decision last night Mr Davidson? Better Together my fragrant arse. But the message is very much that The People Have Spoken. It’s the crowd-funding thing. If the media are giving the wrong message then the people can and will speak. And we should all be grateful for Stuart Campbell, through Wings Over Scotland, for giving us the platform. It will be interesting to hear how his unique readership statistics shift after the site’s airing on prime time television. The game is changing. And there’s more distress for Labour; Grangemouth again, refusing to go away. Deans has fallen on his sword, the architect of the threats that nearly ended an industry. And the Falkirk selection aspects to his dark deeds are not gone, about to reappear from the carpet under which they were swept by The Party. More will come out in time, I’m sure. Meanwhile here’s Derek Bateman, very much part of this new media thingy that’s changing our ways, with some words of advice for the wreckage that is Labour in Scotland today. But really it’s all about Scotland Tonight. Well Done. More power to your Wings. And on top of that Scotland is one of three best countries in the world to visit next year. It’s gonna be a goodie. 1959, or at least it was for me. But it wasn’t such a good year for nine fit young things from Sverdlovsk, as Ekaterinburg was then known. Back then the Cold War was simmering along, close to boiling actually. Khruschev had taken over Stalin’s mantle; the Gulags were overflowing; mistakes, the wrong word in the wrong place, were costly. So the nine, from the Ural Polytechnic Institute, dedicated their trip to the mountains, with skis and tent, to the 21st Communist Party Congress, and off they set. None returned. It was not a story I knew. 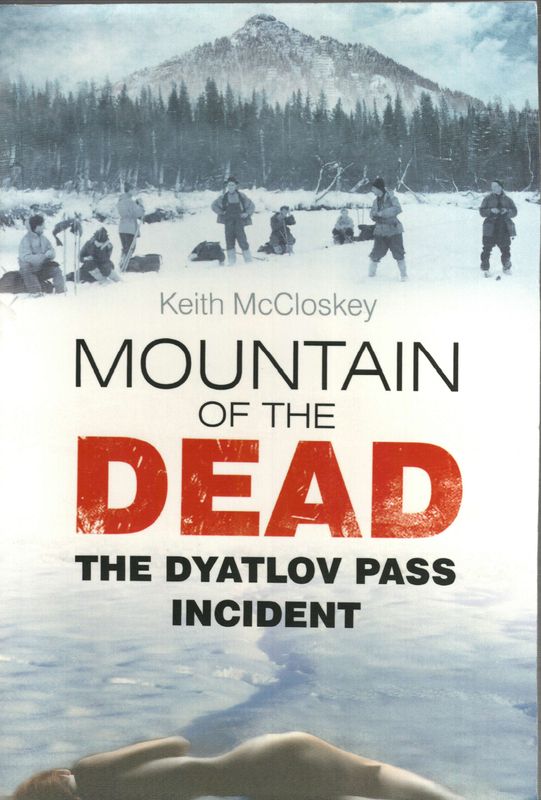 But I liked the look of Mountain of the Dead – The Dyatlov Pass Incident, recently penned by Keith McCloskey. And a whole world of conspiracy theories opened up. Engrossing stuff. But there was no internet in 1959, when the bodies were found, the enquiries began. And there was no google when the entire area was closed, for years, Access Denied, and the files were not available. But there were survivors, from the search teams and the UPI. And in less dangerous times they were able to talk. And bit by slow bit files became available; and the jigsaw takes shape. Pieces are still missing. And it’s not over yet. For McCloskey tells of ongoing studies, and I’m on the lookout for information on The Lair of the Golden Woman. Two American researchers into paranormal activity in the USSR have promised more this year. Step forward Stonehill and Mantle. We want more. Until then there’s all sorts of theories to try out for size. And of course the Fortean Times has had a say too. These were the days when east and west were busy counting each other’s bombs, and inter-continental ballistic missiles. The Space Race was underway, and the Soviets were streaking ahead. But the bodies were found on the wrong mountain. They had internal injuries, and radiation. The tent was slashed from the inside in their desperation to vacate, as they rushed out into seriously sub-zero temperatures with inadequate clothing and barely any footwear. There were no apparent physical injuries, aside from one missing tongue and a bit of discolouring. But as well as the wrong mountain, the tent that was found, weeks later, was erected wrongly, different from photographic evidence from earlier in the trip. The view from the plane that ‘found’ it was of a couple of nearby bodies. But on the ground the tent was buried in snow and the bodies were a mile or two away. In the night between plane and search party no snow fell. There may have been military activity; and there may have been illegal use of a helicopter. And the skiers may have photographed it. And, and, and. And four decades later two separate workmen, in the same area, a mineworker and a forester, witness, two weeks apart, ‘light set’ phenomena, and infrasound. Between times, in 1979, a closed military installation had an anthrax leak. 65 died, the wind having been blowing away from the closed city of Sverdlovsk and its 1.2m. But the military and medical files were taken into the care of the KGB, under the guidance of a certain Mr Yeltsin, then local bigwig and himself also a UPI graduate. It’s a grand place for conspiracy, even now, is the former USSR. Closed cities; the disappeared; files gone; listening; secrets; and sentences. We hear too that around the same time that Igor Dyatlov took his team to the mountains, there had been an escape, several hundred zeks from the local gulags. It was a military zone, still is, for the Russians hide their nuclear arsenal in the middle of nowhere, rather than on the river by a major city. Disappeared. By Any Means. Perhaps the youngsters were just in the wrong place, at the wrong time. Oh, it’s enthralling stuff. To think that these things happen in our own lifetimes. Actually I was in that warm and cosy place just before stepping out into the cold, but from this distance it’s more or less my lifetime. But it wasn’t Sverdlovsk cold into which I emerged, and the Cold War wasn’t on The Bedside Table then. Now The Lair of The Golden Woman, tell me more, please. Or perhaps not. We haven’t talked about Grangemouth, yet, though the dust is beginning to settle. If you missed it, then perhaps a good summary is from our friends over at Bella Caledonia. And there’s some excellent after-coverage at the Sunday Herald today. The whole situation has taken us back to days gone by. We had trade unions muscling up, though some very large doses of humble pie are on the Sunday dinner table. And of course it was the union that kicked it all off, with threats after disciplinary proceedings on their full time official allegedly doing some Party work in company time. This was the same official up to his oxters in that stooshie at nearby Falkirk, the one that eventually saw Unite slash their funding to The Party by 90%. Remember in all of this that it is the unions who put the Labour leadership in place, against the wishes of the members, north and south of the border. And we were minded of a mill owner, in the dark days of several hundred years ago, trampling all over the fodder that spun his yarn and laid his table. Bluff, double bluff and counter bluff. The plant’s closing, liquidators next week, off you go now, all 800 of you. And the other 800 might not be far behind. Full time official no more. If you tuned into PMQs last week, or Question Time, you’d be forgiven for not knowing anything about it, for 800 jobs in a wee outpost didn’t register. It was only Scotland’s oil industry, the pipeline, the terminal, the refinery at stake. It finally registered with the BBC when a rescue package was agreed. For the intent of the state broadcaster then was to try and put words into Salmond’s mouth – words along the lines of Westminster’s importance to Scotland. Listen for yourself how that one went. For thankfully Rev Stu gives it a wider different audience. And if there’s one man comes out of the Grangemouth events with any credit, it’s Alex Salmond. Even the Sunday Herald says so. Yes it’s Gardham’s day off. And as is usually the case, Iain McWhirter tells it as it is. And there’s much more detail on the whole sorry episode over at Newsnet. There’s more coming up from Stuart Campbell at Wings Over Scotland, for you might have heard Ken MacDonald on Radio Scotland’s Headlines programme this very morning, discussing the importance that Wings and Bella, and Newsnet too, are having. And talking at some length of the latest of Wings crowd-funded Panelbase polls, the results of which are being released today, and examined in depth over the next few days. It’ll be hard for the big boys to ignore it, especially with Ken and Derek Bateman not afraid to speak their minds these days. Wonder what it’s going to tell us? Crowd-funding. It’s getting more important. The Common Weal are going places. Bella have big plans. Wings are polling. We could have more from Rough Justice, the boys behind The Fear Factor, for they’re planning a little movie next year, if we all dip into our pockets. All it takes is a few people with an interest, a few pounds each. The world is changing, And it’s for the better. PS Over at Wings Stu has been delving into his poll results. Much food for thought in his analyses. A conversation, but moments ago, the typed rather than spoken word, brought something to mind. It was the Queen of Hearts, on the other end of the email, from her urban sprawl where the coos do not invade the garden, or not yet anyway. Apropos nothing much at all I mentioned that Dr Finlay was chuntering away in the background, as I enjoyed some quiet time with The Urchins safely abed, and The Rural in committee discussing things of importance to the wifies of the parish. Dr Finlay, aye Janet that one. As it happens it was just the other day that the rest of the family took the final three seats, leaving yours truly to walk in the rain, aboard the charabanc known as the Pride of Tannochbrae. If I watch the good doctor long enough I’ll probably see that same bus whilst he’s out on his rounds. I had meant to make a few notes of our afternoon out, but hadn’t got round to it; forgotten it even. There is a festival going on at the moment, a Little one. It is in one of my favourite towns, the one with the bookshop; yes that bookshop, which reminds me that Linda Cracknell, who I have mentioned a couple of times, is at said store today, with her new book, Call of the Undertow – a copy of which is already tucked away for a certain person’s festive stocking. Anyway, Atkinson-Pryce Books are playing a significant role in the Biggar Little Festival, and opening the shop on a Sunday afternoon was one of the things that drew me south, with a birthday token looking to be exchanged for reading material. A transaction was, as it happens, completed and The Bedside Table groans further, with tales to be told another day. There was a second-hand book fair too, at the Puppet Theatre. But it was dire, the book sale, not the theatre. But the disappointment was tempered with a guided tour of the theatre a few minutes later; it was raining outside. Urchin the Younger was with me, and he was keen to look around. Being somewhat underwhelmed at the prospect, but recognising that it was free, I put on my happy face. Blown away, both of us. What a treat we had from Purves Puppets. The theatre itself is spectacular; a sort of Victorian-style traditional theatre, in miniature. It has boxes and pillars, statues – of Mr Punch and Mistress Judy – and lighting and curtains and all sorts; and there’s seating for a hundred or so, of all ages. There’s a superb mural painted by our host; a Russian take on Snow White. Quite magnificent. Then the puppeteers got to work. Wow. Boy Urchin was entranced. And as a result the best wee school around is considering an alternative to the annual trip to the panto or cinema over the festive season. I hope they can make it happen, for it will be an experience for the children. There should just be enough time for what will be a lengthy journey either side of the show. And there’s plenty more to see and do as the BLF rumbles on. From jazz to book readings, rogue Vikings saying sorry and of course a stonking single nougat on the ice cream trail. You’ve missed Andrew Greig by now, but there’s more to come. And you can take a ride on the Pride of Tannochbrae; or better still on the magnificent coach & four that plied the high street, from the bookshop to the hog roast, on that Sunday afternoon. And you can thank the Queen of Hearts for bringing it back to mind. I have been doing some of late, when I really should have been busy with other things; perhaps a bit of cycling, or some writing. But instead my mind has been elsewhere, fighting a slough of despond at times, and latterly embroiled with that foul thing we call work. It is necessary, and sometimes fun. But I dream again, for the latest issue of Earthlines thudded on the mat earlier; truth be told the postie handed it to me over the gate, in a windy drizzle. The gates are closed because, as happened in the same week 12 months ago when the house was empty for a few days, the garden was invaded, by cattle. Oh yes, someone else’s black & white heifers have been causing havoc on those manicured lawns, trimmed borders and other wild spots that go to make up The Policies. And it is infuriating. Did I not just spend three months earlier in the year seeking recovery from hundreds of cloven hoof holes up to 4″ deep, filling, forking, rolling, seeding? I remember it well. And now I face it all again. First up will be countless trips into the field, with barrow, gathering mounds of fresh diggings which the mole seems to find easier work. But at least he brings it to the surface for me. So other peoples’ beasts and fences are a source of some angst at the moment. And on the back of the destruction of the chicken flock, and with no eggs, those deep yellow ones you only get from your own garden, for a quick and effortless lunch; on the back of the long-awaited parcels arriving, predictably, 20 minutes after we set off for the Northern Wastes; on the back of an alarming asthmatic consequence; on the back of the angst of the Northern Wastes….. it’s not been fun of late, and I’ve been quiet, you may have noticed. But Earthlines arrives, and I dream more. As always, with any magazine that comes in, I turn to the book reviews. Tim Dee’s Four Fields caught my eye down at Wigtown; but I put it back and opted instead for his The Running Sky, which awaits my attention. And there’s a fine article from Miriam Darlington, on otters, or more specifically Sandaig, Camusfearna as you may know it. And I remember getting lost on the trail down to the waterfall, and sitting as the rising sun glistened on The Ring, and dreaming. And I’m intrigued by Birds & People, by Mark Cocker and David Tipling. It promises much, from hunting with eagles in Mongolia, to Amerindian shamans; and good food, feathers for warmth, folklore and more. A book, it says, as much about us as about birds. Hmm. Now the sojourn to the north east was made with good intentions; four bikes were towed 200 miles, and back again. But only one turned a wheel, and it wasn’t The Grasshopper, despite perfect weather and managed time. For that was when the call came in, the one of the cows in the garden, and skies darkened, deeper, wretched. I had been aware that our hosts at Earthlines sought a buyer for their Two Ravens publishing house. Dreams, again. And now I see they’re ending their time on Lewis, intent on the Emerald Isle. So there’s a house for sale, and a croft, as well as a publishing house. But the magazine will continue, dug from different peats perhaps. It’s a while since I’ve wandered the Stones of Callanish, watched from the Ness lighthouse as the waves thundered in, thinking of the guga hunt across the water. There are midges, and the wind can blow. Cycling may not be easy. But then again, can the wind possibly be more unkind than that which sweeps across The Towers, almost relentlessly? And I think of the days when we had a few Shetland sheep, and ponies too, and said, Never Again. But we can dream. And if you’ve a mind to do a bit more than dream….. go on, have a look, at the house, and the croft, and what might be. Make it so. Could I, possibly….. ach, dreaming again; or am I? You should be thankful that there are no photos to accompanying today’s notes. We’re in need, it seems, of a resident Brer Rabbit, disguised as the Tar Baby or otherwise. But it’s too late, don’t even think of calling round now Remus, Reynard is on the rampage. For Brer Fox has been, and he’s enjoyed himself. My morning stroll, stop for breath at the shed, battle on round to the coop, was a sad one. A clutch of grey feathers here, some black ones there. And as the morning light slowly paled, there she was, the speckledy brown, outside the office window, twisted, stiff, and very, very dead. And under the maple hedge, looking very forlorn, was one little light brown chookie. There was nothing bright in her comb, and no one to talk to. She pecked slowly, joining the sparrows waiting for droppings as the starling and the woody squabbled on the nut feeder. She’s never been the best layer, that light brown hen, and she’s just starting her moult. Even when was laying daily she usually managed to hide them away till you found a clutch spilling out of some undergrowth somewhere, rotten as she clucked and chuckled away in the background. I blame the wind; for it shifted to the north, and the gate on the run closed. And it closed before nightfall. But then again, I can just picture that sly old fox, sneaking in earlier, nosing the gate closed….. They couldn’t get to bed. It’s often a problem when the days begin to shorten; chickens in bed before you get home. Usually it’s a case of locking the door, safe and sound. But when the gate’s closed…..
Well, then they’ll look to get off the ground. Now I don’t know how the fox found them, for I hunted about with a hefty beam, under the hedges, behind the shed, up in the branches of the little stand of leylandii that were planted to give shelter to the ponies, thick and tall now that there are no ponies. But there were no hens to be seen. Until dawn, and then there was simply feathers, grey ones and black ones,and one carcase, brown one, unwanted; and a very sad and lonely bird. How she escaped the carnage I’ve no idea, but she did. I looked, I did, but I don’t smell like a fox – OK I’ll rephrase, I don’t have the olfactory sense of that vixen. Even the cat’s looking sad. For he’s been in the wars too, and he’s not as young as he thinks he is; a position for which there is some empathy in these parts. He was out on the grass, munching away, furry it was, no left overs. But something had opened a recent wound, on the cheek, getting just a bit too close to the eye. There’s been a few of those wounds this year. But this time he’s very sorry old puss, an open wound and bloodstains, on the white of course, not half-hidden on the black. The ignominy is there for all to see. So it’s a sad little house right now. And we leave it behind for a few days. The road north beckons, with rich autumn colours in the glens, and the roadside filled with a harvest that seems widespread this year as red bunches pull the leaves down to browsing height. But the bikes are going north too, all of them. And their may be notes from other bike trails, the whisky trail too, perhaps. But there won’t be omelettes for dinner. Not for some time.